This retro-looking stompbox keeps things simple and unfussy, while boasting unique and clever features. I work primarily as a producer and audio engineer, and I’ve been fortunate enough to have worked with some artists of note (some readers may know me from an article that I wrote in the January 2016 issue of SOS about my work with David Bottrill, recording and mixing Rush’s R40 Live). But I’m also a guitarist, and several months back I was talking shop with Jeff Schroeder, long-time guitarist of the Smashing Pumpkins. One thing I asked him was: “What are your favourite guitar pedals?” And in a very short list of favourites, he included Free The Tone’s Flight Time digital delay. 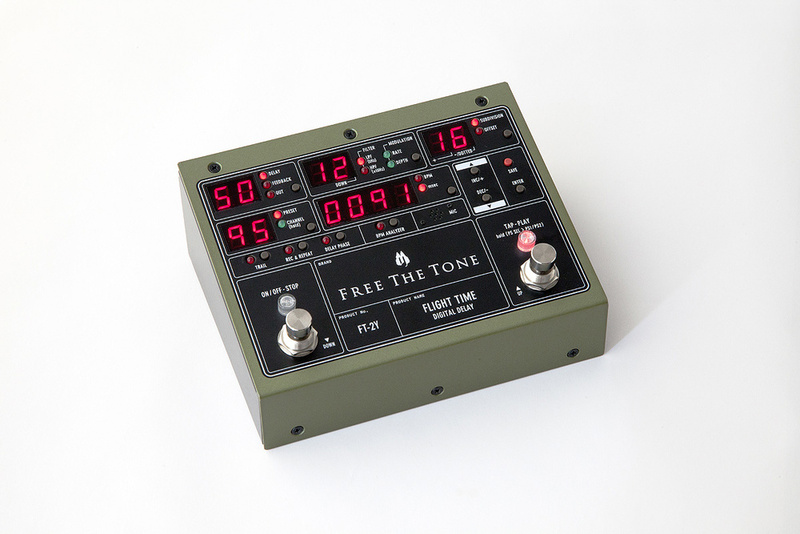 Free The Tone are a Japanese company who are not yet so widely known in the West, but some who are in the know have made the Flight Time a staple in their live rig. 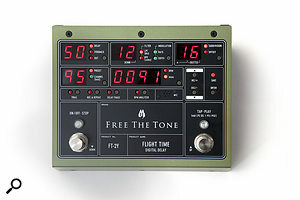 Recently, Free The Tone released the second-generation Flight Time, the FT-2Y, which implemented ideas and requests from their devoted following. Given Jeff’s recommendation, and my curious-skeptic nature, I had to try it. The Flight Time FT-2Y radiates retro nostalgia and has a familiarity to it; it’s like looking at the control panel of a spaceship from an ’80s sci-fi film. Adorned with five seven-segment displays, numerous tiny switches and LEDs, as well as two foot switches, each with their own indicator LED, it inspired confidence that I immediately understood the pedal and that there were no confusing knobs with words like ‘parameter’ or ‘menu’. The Flight Time is housed in a road-ready metal chassis and is relatively compact given its feature set — it measures 146 (W) x 120.5 (D) x 57 mm (H) — which will be a blessing to those with limited space on their pedalboards. On the side of the pedal, there’s a switch that allows operation at line level, and on the back there’s a Kill Dry switch that outputs only the effected sound, to allow it to be used as a send effect. 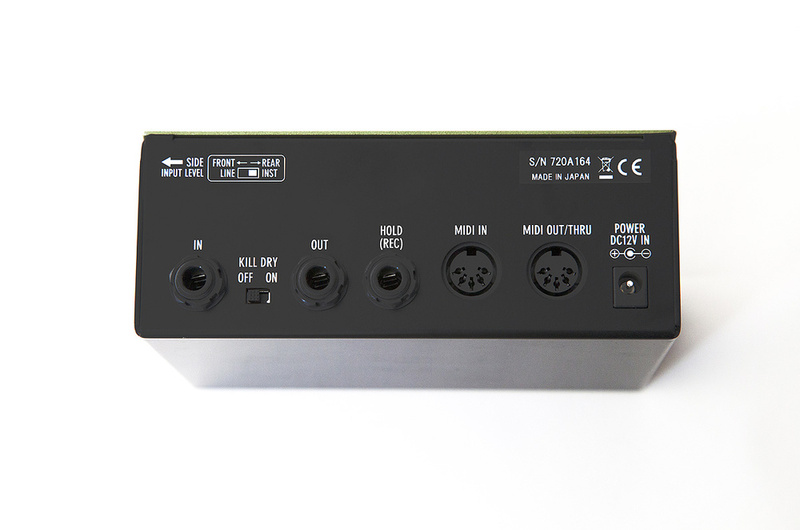 The rear panel also hosts the power-supply inlet, which is 12V, centre-negative and requires 400mA (the provided power supply is rated at 2A). The rear panel’s ‘Kill Dry’ switch allows the Flight Time to be set up as a line-level studio send effect.Photo: Ryan McCambridgeFree The Tone’s pedals have a reputation for being incredibly quiet, and the Flight Time is no exception. Standard mono TS jacks for the input and output are found on the rear, as is one for the attachment of an external momentary switch to use the Record and Hold functions. The Record mode, which is selected using the Rec & Repeat switch on the front panel, is similar to other looper pedals, though record time is limited to 20 seconds and can’t be layered. It does, however, allow for the storage of recordings to one of the 90 available presets (there are 99 presets in total, of which nine are factory presets that can’t be overwritten). If the momentary switch is being used in its Hold function, the delay’s feedback is held for as long as the momentary switch is engaged. This allows for long, ethereal trails or stutter effects depending on your delay time. The rear of the pedal also has two five-pin DIN sockets for MIDI In and Out. The MIDI input can be used to change presets or adjust the pedal’s parameters. As far as I could tell, the Flight Time can’t receive a tempo clock from the MIDI input, which is unfortunate — most people could work around this by saving a song’s bpm to a preset, but it could be a potential deal-breaker for some. The MIDI output is primarily used for storing presets on an external computer or transferring preset data from one Flight Time to another. Photo: Ryan McCambridgeThe front panel is laid out very logically, and although some parameters share one of the five displays, the design still allows for all necessary information to be shown at one time. The first display shows the delay wet/dry amount, the delay feedback amount and the overall output level, which can add up to 3dB, and it’s useful for balancing any level changes between presets. The next display shows the modulation rate and depth, as well as the high- and low-pass filter settings. The note subdivision is shown in the third display, which can be any division from 16th to whole notes, and relates directly to the fifth display that shows your delay time in either bpm or milliseconds. A clever Offset function also appears in the third display, and this can push the delay time ahead of or behind the beat by up to 99 milliseconds. This can help keep the repeats audible in a mix by getting them out of the way of other elements playing right on the beat. The fourth display shows the current preset number, and if a parameter has changed from the saved preset, a dot illuminates in the bottom right corner of the display. This display can also show which MIDI channel the Flight Time is responding to in the incoming MIDI signal. Pressing the small switch next to any of the functions causes the currently selected parameter to flash, indicating that it can be adjusted with the INC/+ and DEC/- buttons. Pressing the switch next to the function again selects the next parameter in the group of that display, which is indicated by an LED illuminated next to the parameter’s name. Any adjustments will be held but for more permanence, pressing the red Save button will save the current setting to any of the preset numbers. Switching between the presets can be achieved in the same way as changing any of the other parameters, but for convenience you can also change between them using the footswitches. Activating the Trail switch preserves the delay repeats’ decay when switching between presets or when bypassing the unit itself. There’s no shortage of boutique delay pedals: Strymon, Eventide, Empress, TC Electronic and others have advanced digital delays past the stigma of their digital ancestors, with a modern generation that rivals their analogue counterparts in tone while outgunning them in terms of versatility and control. I own and appreciate many of these pedals and I commend their designers for expanding the limits of delay pedals, but, for me at least, a plethora of options can often be more stifling than it is liberating! Thinking about it from a design standpoint, the more functionality something has the more complex the interface becomes and often this results in the abhorred curse of menu-diving. For this reason, I am drawn to gear that’s designed to do one thing really well, and the Flight Time is a perfect example of a manufacturer creating a product with specificity. You won’t find tape delays, distorted delays, reverse delays and so on in this pedal. Though there’s no denying the insta-vibe of effects like wow and flutter or tape saturation in a delay, often subtleties of heavily effected delays tend to get lost in a dense mix and a clean digital delay ends up being the most effective tool for creating depth. This is the Flight Time’s greatest asset. That said, for those who are looking to add some character to their delay, the Flight Time has high- and low-pass filters, as well as modulation. Users can emulate very analogue-like tape effects by finessing these controls. The high-pass filter runs from 20 to 990 Hz, which can be used to clean up the delays of a thick guitar tone, while the low-pass filter runs from 22kHz right down to 1kHz and can be used to darken the delay repeats. Using both the filters, users can create band-pass, telephone-style effects. The modulation is controlled in this same section and allows for both positive and negative polarities. Negative polarities are indicated by a dot in the right-hand corner of the display when adjusting the rate. On the subject of polarity, the delayed signal’s polarity can be inverted if the user finds that phase cancellations are washing out the signal — this is achieved by pressing the Delay Phase switch on the front panel. As mentioned above, setting the delay time can be done manually, but it can also be tapped with the footswitch. A unique and useful feature of the Flight Time is that it houses a small microphone and can analyse the tempo of the sound that mic captures. When the BPM Analyzer switch is engaged, the tempo of the performance is calculated in real time relative to the tempo that has been set on the pedal. If its analysis is within 20 percent of the set tempo, the Flight Time will adjust the delay time accordingly. If the BPM Analyzer reads the tempo as deviating more than 20 percent from the set tempo then no automatic adjustments will be applied. The Flight Time captures the spirit of a studio rack delay and distils it into a guitar pedal, while prioritising features for professional players. The methodical design is one of the Flight Time’s most attractive features and most professionals I’ve met will attest to the fact that considerations of workflow are just as important as those of sound quality — neither are compromised in this pedal. The Flight Time was obviously conceived with the specific purpose of being a digital delay workhorse. I can see how some people would be disappointed by its lack of algorithms, and perhaps its mono output, but I think that would miss the point of this pedal. My one minor gripe is the inability to read incoming MIDI clock, and most players won’t miss this feature. 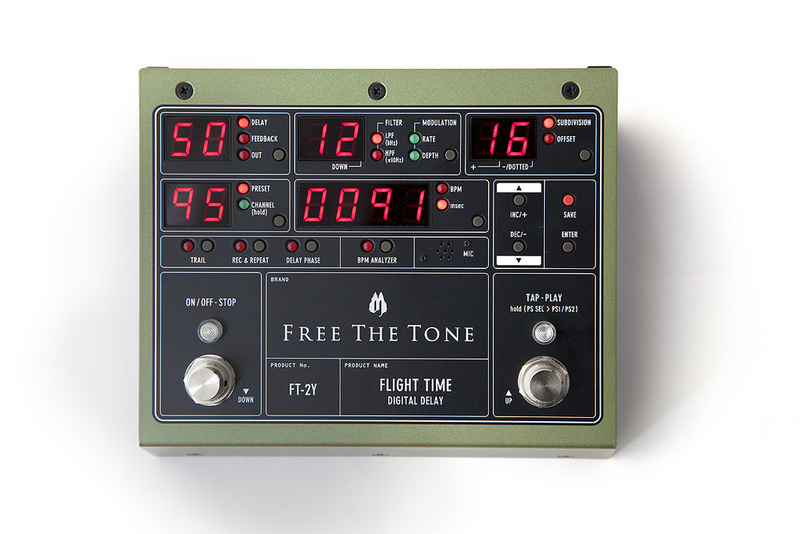 With its clear visual feedback, ample presets and, overall, attention paid to the details that matter, Free The Tone’s Flight Time could definitely be finding a home on more pedalboards in the near future. Well thought-out interface in a small chassis. Sounds fantastic, with low self-noise. Generous number of preset slots. Professional functions, like delay offset and delay-line polarity reversal. Not just for guitar: accepts line-level too. Unable to read incoming MIDI tempo. Some may want more algorithms. 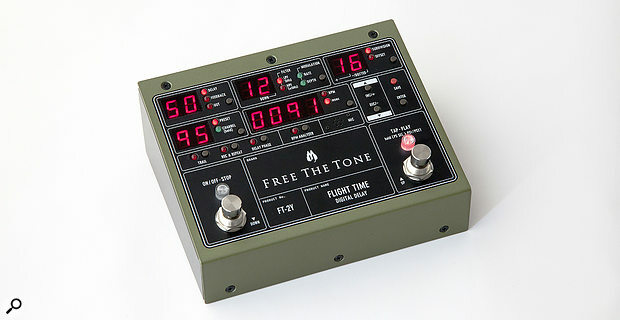 The Flight Time puts the essence of a studio-quality delay in a guitar pedal format. With its clear interface, streamlined functionality and innovative features, it excels both in the studio and on stage.